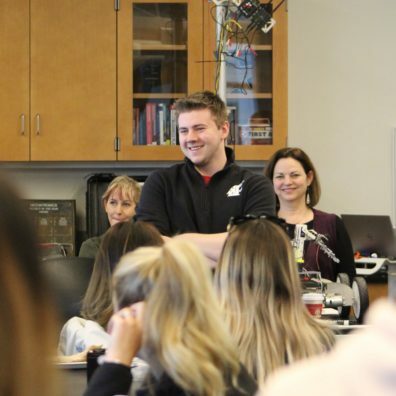 EVERETT, Wash. – Jan. 24, 2019 – Engineering, communication and business students are working together at WSU Everett under a merged coursework project launched this spring by three faculty members exploring greater opportunities for interdisciplinary studies. Seniors in electrical engineering have spent the academic year designing and building various projects, sponsored by, overseen and delivered to local industry. During the second semester, Edward R. Murrow College of Communication students will develop communication plans for their assigned project while Carson College of Business students will create business strategies. The seven engineering projects range from developing a new battery system for the OceanGate submersible and developing metrology instrumentation for Fluke to using coral to take carbon out of the atmosphere for Boeing, or creating an interactive museum exhibit to inspire children to pursue STEM careers. The valuable exposure students receive to peers in other fields is designed to help them better understand how they can work and interact together across disciplines, which should advance their ability to succeed, according to Cuen Paxson. Each team member brings perspectives couched in their experience within their unique field. Students of Dr. Soobin Seo, an assistant professor in the Carson College of Business, will plan specific business strategies for the teams to ensure the project, instrument or client is both viable and sustainable when reaching the marketplace. Seo teaches MRKT360, introduction to marketing. The students will still operate and be graded within their separate courses, but will meet a minimum number of times as a team to learn about the skillset each brings, develop strategies related to their project and complete their respective assignments. Student reactions were strong, including anticipation about learning from an expanded form of teamwork, to anxiety about shared responsibilities. Murray noted the experience will embrace a growth mindset in which challenges, and even failure, are part of the learning process.